Hershey Chocolates has committed to using 100% Certified Fair Trade Chocolate by 2020. This means that by this deadline, every piece of Hershey Chocolate to come out of the factory, whether it’s a Hershey Bar or a Hershey Kiss, is going to be Certified Fair Trade. This news broke back in October (again….how did we miss this?). And, it’s amazing because Hershey is a gigantic company. While any person or company that commits to supporting fair trade will make a difference, stop and think about the kind of impact a global corporation can make. This is especially important because of the child labor that’s endemic on the cocoa regions of West Africa; it’s estimated that between one and two million children currently work to harvest cocoa in this region. Hershey is on a mission to hold their supply chain accountable for any child labor that’s discovered, and I applaud this effort. 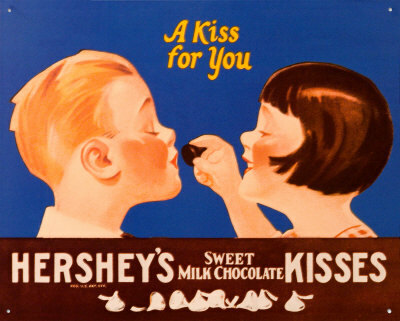 Some of Hershey’s products are already being made with 100% Certified Fair Trade Cocoa. Their Bliss and Dagoba brands are both now fair trade. I believe their Scharffen Berger brand will be 100% fair trade by the end of 2013. I’m thrilled about this news, and you can bet your bunny I’m going to support their efforts with some of their fair trade chocolate this week. Yum!